This is the local supporters’ website for St Wulstan’s Local Nature Reserve. 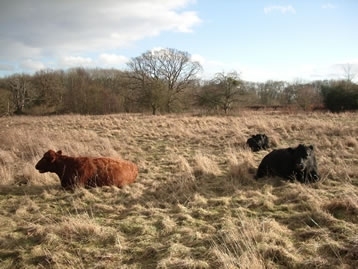 Originally the website was set up to celebrate this wonderful piece of Worcestershire countryside and the work of the volunteer group that looked after the reserve. The local group has now closed down because the reserve is fully managed by the County Council, but the website remains as an important information resource and a record of the fantastic work done by the local volunteer group in securing the long term future of the reserve. The reserve first opened on the 25th April 1997. Shortly afterwards the local volunteer group began to look after the different habitats that were becoming established, and to look after the footpaths and trails. The nature reserve is owned by Malvern Hills District Council and is now managed by Worcestershire County Council's Countryside Service, who can be contacted via The County Council Hub. If you want to find out more about the reserve, would like to become more involved, or if you want to know more of the fascinating history of the US Army Base, TB Hospital and Psychiatric Hospital that were all at St. Wulstan's before it was a reserve, you'll find everything you need on this site. The reserve is open to everyone. At any time please feel free to enjoy a walk through the hay meadow, wildflower areas and the woodlands. There is a Geocache located at the nature reserve. For details see here. Read a fascinating new interview of a patient when St Wulstan's was a psychiatric hospital here. This booklet covers in detail the history of the land at St Wulstan’s, and what went on when it was a US Army Base, TB Hospital and Psychiatric Hospital. It is available at https://www.worcestershire.gov.uk/myselfservice/nurturenature.aspx (Ignore the fact that it says "Walkers Guide" - they got that wrong, it is a history booklet which collects together details from newpapers and individual accounts) or via The Hub. Come along and help out at one of the volunteer days! For more information click here. Ann Bowker has been busy recording the glow worms and butterflies over many years at the reserve. For more details see our glow worms and butterflies pages. Visit our Gallery for stunning photos of the reserve.